I've been asked that by a few people over the last 7 months. I haven't made an entry since the middle of December, and there have been some small changes since then. Let me back track to the start of this year. Craig was still on the regional team, mainly doing 200-300 miles a day runs in Washington and the Portland area. We took a week's vacation and traveled down to California to visit family and friends at the end of February. Shortly after returning, Craig was told to turn in truck 418 and move into a brand new heavy haul truck. Boy, talk about a shock. It took us by surprise, and upon getting the keys to the truck and checking out the inside, we began to wish we had our old truck back. This heavy haul had absolutely no storage and was much smaller inside, so much so that is was near impossible to stand and have any room to change clothes. Bottom line, we were miserable in that truck, and with it having the big stacks, it was a beast to back up. I opted to get off the truck to give Craig more room, but there was never any love lost with him being in that truck and we looked into ways to remedy that situation. He could go back running solo up and down the west coast again, or there was the option to go back to team driving and make a bit more money. Since Craig was just at three years until he could retire, we opted for him to go back to team driving to make the most money that he could and possible retire 6 months prior to his 62nd birthday. The only mandatory request that Craig had for a team driver was that he be a non-smoker. That proved to be quite the request to fill, and as weeks went by, and no co-driver could be found, Craig grew more and more unhappy driving that heavy haul truck. Thankfully, the boss knew of his unhappiness and decided to put him in a brand new team truck as a solo driver until they could find him a partner. Let's just say that the new team truck was like the Taj Mahal compared to the heavy haul truck. Extremely roomy, tons of storage, a passenger seat that swivels 360 degrees, a refrigerator, and no stacks to block his view when backing up. Shortly after moving into truck 448, I had the opportunity to check it out, and if he could keep this truck until he retired, without going team, I would be back with him in a flash. As it stands now, Craig is basically a solo driver awaiting finding that right person to team with, and I am staying at home and enjoying having family come up and visit me. We've found that during the summer, especially in the Central Valley of California, it is just too hot to have Craig sleep on the upper bunk when I'm with him. That's not to say, if a co-driver is not found by November, that you will probably find me back out in the truck with Craig. As far as updating the blog, since I'm not on the truck, it is difficult to find much to blog about, but I will certainly try to post whenever there is anything of interest to share. Until then, we are counting down the months (32) until Craig can finally hang up his CDL and fully retire here at home with me. We made it home this past Thursday for home time. With as mild as the weather has been lately, we really didn't expect to see much snow when we arrived at home. Boy, were we surprised. It looked like a winter wonderland. We had a bit of surprise when Craig went to turn the water on. Seems our heat strip was malfunctioning and with the minus degree weather we had the previous week the water had frozen. Craig had to drive into town to purchase a new one and within about 10 minutes the water was flowing again. During our first night, there was an additional showering of snow, just enough to cover our Jeep. With all this snow around us, we figured we'd BBQ some New York steak that Tyson so generously donated to us before our last home time, when a shipper refused a case because the box was torn. We love those kind of rejects right before home time when our cooler is empty! Craig managed to do the lazy man BBQ'ing from his recliner in the living room. We made sure to cook extra to take back out with us on the truck. Looking at the weather forecast for the next 10 days or so, it still appears that we'll have milder than normal snowfall and temperatures. We'll take that as we look forward to another couple of days at home in a mere 14 days. The weather. Seems like that was all everyone was talking about last week, and no more so than on Facebook. My California friends were lamenting about the cold, a mere 26 degrees, while at home in Usk, WA we had minus 9 degrees. When we're in the truck and traveling we hit just about everything Mother Nature throws out there, but we always manage to remain toasty warm inside our moving semi truck. When we received a load of meat for the Portland, OR area, we were shocked as we traveled our favorite scenic route, Highway 84 along the Columbia Gorge. Jack Frost had payed a visit and threw in a fair amount of snow. Craig and I both commented that we had never seen this much snow in this area in all our previous winters of traveling through it. It almost reminded us of our days of traveling through some areas of Canada. I know I'm jinxing myself, but so far, this is the latest into the season that we haven't had a fair amount of snow fall. I'm not complaining, I like the roads clear and bare, as it makes for much safer travels with all the four wheelers out on the roadways. I'd much rather enjoy all the snow in the comforts of home, which we will be for a couple of days this week. We went back to work the day before Thanksgiving getting a dispatch to deliver juice to Wal Mart. I love these runs, short and sweet, and by 7pm we were empty and headed into Prosser, WA for the night. This is the first time since driving truck that we haven't been able to find someplace to enjoy a Thanksgiving meal. Craig tried to make things better by finding an app on his tablet with a roaring fire. It did make our simple in truck dinner a little cosier. Thanksgiving morning we walked to the Starbucks across the street and enjoyed a hot coffee and read about the storm that was heading our way. We did a little local pickup on Friday and on Saturday was given a Tyson meat load with 5 deliveries over three days. With our routing we knew we would be in Union Gap, WA on Sunday, and with an Outback Steakhouse next door to the truck stop, we could enjoy a Thanksgiving meal then. While we were eating several of the other diners were getting phone calls on their cells regarding Snoqualmie Pass and the snow that was expected. We went to sleep that night not knowing what we would encounter when we made our own trek over the pass at daybreak. In the morning I checked on road conditions and found that the pass had been closed due to high winds and trees removal, so we went about our deliver in Union Gap and hoped for the best. By the time we finished up and had to make our way to Everett, WA the pass was opened up with snow and slush on the roadway. We expected it to be worse than it was, but by the time we got up the hill it was looking pretty good. We can only hope the rest of the winter snow driving is as nice. I've been back out on the truck since November 1st, and have noticed over the past two weeks how quickly Fall is giving way to Old Man Winter. There are only a few areas where you can still see some Autumn colors before it will be covered in a blanket of white snow. I'm holding onto as much of it as I can before the snow boots come out from the side compartment on the truck. We've had some great runs since I've been on the truck, and we are scheduled for home time next Saturday. We plan to go back out on the road the day before Thanksgiving, and hope to take home time every two weeks during the Winter in an attempt to keep up with the snow at home. It will also give me a chance to try my hand at driving in snow again, especially since we purchased the Jeep 4x4 with that purpose in mind. I'll let you know how that goes. There is nothing I love better than Fall. That is why I have been spending this season at home enjoying the changing colors. I'll be back on the truck by the 1st of November and no doubt blogging about our winter adventures. Until then, I'm enjoying the beautiful scenery at home. There's one thing we can always count on out on the road, and that is to see some things you just don't ordinarily see on any given day. The other day really made us stop and laugh out loud. We were rolling along Interstate 90 in Washington and up ahead we see a car pulled over to the side of the road. Nothing too strange about that, except we see a young lady squatting down taking care of nature's business, right out in the open, which we don't see every day. Just as we approach the vehicle and move to the outside lane, she stops mid stream, so to speak, to raise her right arm frantically up and down, signaling the international sign for a truck driver to blow the air horn on the truck. With no other traffic around us, we felt it only right to oblige her request, laughing for a good few miles down the road. We've settled into the new way of driving being on the 25% team. Long gone are the days of driving 11 hours, stopping just long enough to put in your mandatory break, and then taking off for another day of 11 hours of driving. With trips of no longer than 200-400 miles, the days are now quite relaxing, although I must confess there are still days, or should I say nights of driving. But as Craig says, 5 hours driving at night isn't as bad as 11 hours. We're discovering new joints to take the place of the ones we had to give up when we went regional. No longer can we plan on a great meal at Dos Amigos in Weed, CA, but we can count on a fantastic meal at Ramblin' Jacks Rib Eye in Chehalis, Washington, off exit 72 on Interstate 5. We first noticed this place a few years ago when it was closed and under a refurbishing. After it was reopened, we just never had time to stop there long enough to check it out. That all changed last week when we were sent to Chehalis to drop our trailer at the Fred Meyer DC there, and await a load for later in the evening. We were happy to walk across the parking lot from the truck stop to enjoy a late lunch. We were not disappointed, and can see why Ramblin' Jacks is known as Chehalis' best restaurant. We started our meal with deep fried dill pickles, and made a mental note to try the deep fried bacon and gravy as an appetizer the next time we stop there. Craig had a tri tip french dip sandwich, and I had a bacon/blue cheese burger, but swapped out regular fries for sweet potato fries. We only finish half of our lunch as we wanted to leave room to try a dessert. We opted for the cowboy cookie, which was a warm chocolate chip cookie, piled high with two scoops of vanilla ice cream, topped with whipped cream and caramel sauce. We we both happy that we had only eaten half of our lunch, as we had no problem finishing off the dessert. They offer quite an array of dessert with include fresh from scratch fruit pies in season. With our to go boxes in hand, we left Ramblin' Jacks knowing that at the first opportunity, we would be returning to enjoy a great meal. 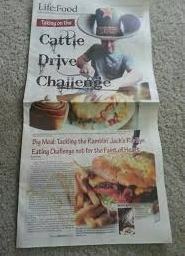 If you're ever in the area, you should make it a point to stop and maybe take on the "Cattle Drive Challenge" which is a 1.5 pound burger, with fries and topped off with a 1 pound cinnamon roll. Go ahead..... I dare you. Every once in awhile, we get a load to a place we haven't been before, and last week that location was Libby, Montana. It's a quick over and back from the company yard in Spokane to Libby with a small 30 foot trailer that gets dropped in the yard around 4am. It's loaded with grocery items to be delivered to a little "mom and pop" grocery store. The ride over is beautiful. Up Highway 95 from Coeur d'Alene and then over on Highway 2 out of Bonners Ferry. Following the Kootenai River, you pass by the scenic Kootenai Falls. 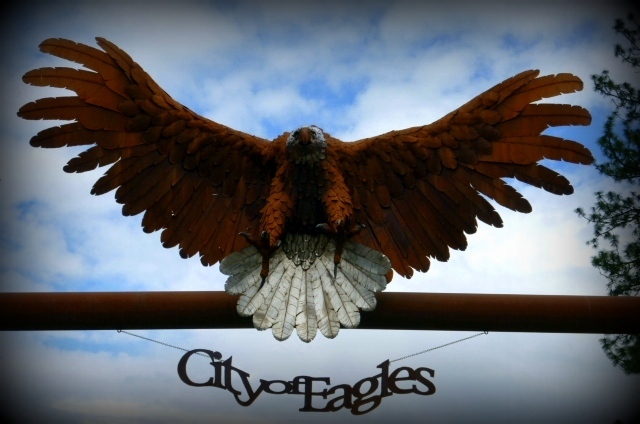 Upon arrival in Libby, you can't help but notice all the metal eagle sculptures all around town. It was fun as we were coming and going to try can capture as many as I could. Another somewhat fun thing was, once we arrived at the store, there of course was no dock. We had to pull up in the alley and off load by hand all the items onto a metal roller conveyor which was propped up on milk crates. Between a store employee, and Craig and I, we had the trailer unloaded in about 40 minutes. Sure was interesting seeing all the items the store had ordered, including a pallet full of ice cream! Come to find out this particular store gets two deliveries a week, on Monday and Friday. No doubt we will be returning to Libby, Montana again in our near future. First off, I'm still withholding my final assessment of this new team that Craig is on for another month of so, but so far, it almost seems too good to be true. No load is ever much over 300 miles, we've yet to be close to being out of hours to complete an assignment, and we seem to have plenty of time to stop and take in some of the sights along the way. Case in point is this huge warehouse fruit stand/antique mall. It is three stories of utter goodness from the fresh orchard fruits, the vast variety of sweets, canned goodies, fresh lavender, and two levels of vintage finds to feast your eyes on. What better place to spend your mandatory 30 minute new "hours of service" break. It was somewhat crowded when we stopped by, being the four day Fourth of July weekend and all, but with a warehouse this big, we didn't even seem to notice the crowds. After walking all three levels, we ended up at the most natural place for me..........the homemade ice cream case. There were only about 6 flavors to choose from, but right there in front was the one I had my eyes on. Maple flavored cookie dough ice cream! Oh my...what a treat. As luck would have it, along with this warehouse on Interstate 90 just outside of Ellensburg, there is another one on Interstate 82 near Yakima. Both of them on routes we will be traveling several times a week, if not twice a day. I'd say its a big "win-win" for us and a place we will definitely be stopping at again. With the "Love of Junk" sale behind me, and too many snowbirds flocking back to our neighborhood for the summer, it was time for me to jump back onto the truck for a little while. Craig and I enjoyed some home time together, and when Sunday morning rolled around, we were headed back to the yard to load up the truck. Craig is trying out a new division within the company called the 25% team. He was getting tired of dealing with the LA traffic and drive, and since Craig is getting closer to his projected retirement age, he wanted to stay more regional. This team of drivers handles the loads that are all within about 300 miles from the Pasco, WA yard, mainly delivering to the Portland/Seattle area. Instead of getting paid by the mile, you get 25% of the total load payment to the company. Craig has been on it for a couple of weeks now, and he is loving it. No more 11 hours of non stop driving, which was beginning to take a toll on him. He is averaging about 8 hours or so a day, and is feeling so much more relaxed out on the road. It also is much more conducive to taking home time and getting home when you want, since you are only a days drive away from either Pasco or Spokane. We are toying with the idea of making Pasco our home base during the winter and moving our personal vehicle there. He seems to go through Pasco at least 3 times a week, and with our vehicle there we can use it to get groceries and get away from the truck when we are waiting for a Tyson meat load. We have already planned out a few road trips to take during some home times to go out exploring the nearby areas.